As a one-time Chattanooga resident and habitual labor journalism tourist to the hills of Eastern Tennessee, I was so excited that I couldn’t sleep when I found out today the UAW was filing for another union election at Volkswagen plant in Chattanooga. The election will likely take place at the end of April or the beginning of May and I am itching to get back down South, but I need your support as readers to do so. However, to raise money for air travel, rental car, lodging, food, and to cover our labor, we need to raise at least $2,000, which is why we need you. if you have the time, please read on, on the history of why this union election in Chattanooga is going to be a national story and why we’ve always kept our logo at Payday as the symbol o the state of Tennenssee with a heart over Chattanooga. I stayed down there in Chattanooga on and off for weeks during the winter months leading up to the union election at the Volkswagen plant in 2013-2014. I even made some great friends. I was inspired as a labor reporter to see what they went through when the pro-union Volkswagen workers found out they lost the union election by only 43 votes. A sense of fear immediately came over many of the union supporters who thought they’d face retaliation. It was Valentine’s Day 2014 and many people canceled their dates for the evening. At a supporter’s house nearby, we drank moonshine and tried hard to come up with jokes to help us deal with the disappointment of the loss. After I was fired illegally in the union drive at Politico in 2015, I used my $70,000 NLRB settlement to move back to Chattanooga, where I founded Payday Report. When I lived in Chattanooga for the year, I attempted to understand the community-labor movement being built in the wake of the failed union election there. The spirit of so many Southern union organizers in such an uphill battle to change Chattanooga inspired me. I wanted to push even harder with Payday to help build a new model of funding precarious labor reporters like myself. 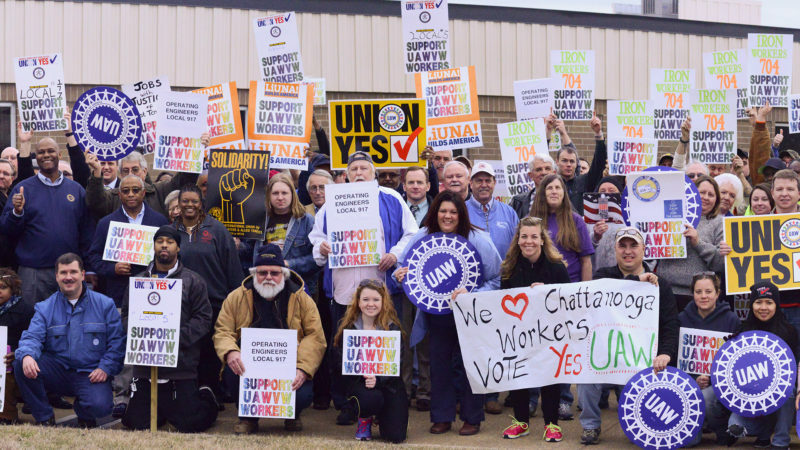 Now, with the UAW announcing a new union election, and the political conditions very different in Chattanooga as a result of that hard organizing over the last 5 years, I can’t tell you how excited I am to go back to Chattanooga to cover this story. Many have asked me why as a Pittsburgh native, who lives in Pittsburgh, I’ve kept the symbol of Payday as the state of Tennessee with a heart in Chattanooga? It’s because the resilience I saw after the fight in Chattanooga was what inspired me to found Payday. We’ve kept it there to show our solidarity. On a personal level, I can’t tell you what it meant to me to be in Chattanooga during those years when I struggled with PTSD. My mother had worked at the last Volkswagen plant that was unionized in Westmoreland County, Pa. in 1988. After the plant closed, my mother struggled with substance abuses and left the family. During the lead up to the first union election in Chattanooga in the fall, I watched as stories of the horror that affected so many families in Western PA including my own were used by anti-union forces. I searched desperately for a way to get into the fight because it angered me so much that my own stories of pain as someone from a Volkswagen plant were being used to tell Southern workers to vote against the union. I published Norquist’s secret plan nearly 4 months before the union election. What I found was a plan of big media buys and community campaigns against unions, which would later fill the playbook used by Boeing and Nissan to defeat the union drives there. Local activists invited me to come down and speak to them in Chattanooga. They really rolled out the red carpet, getting a local columnist on the front page of the local Chattanooga Times-Free Press to welcome me to to Chattanooga, inviting folks to come, warning of how Grover Norquist planned to turn the entire Chattanooga community against me. Unfortunately, my warnings fell on deaf ears. The UAW did not invest heavily in a community campaign at the time in order to counter the hundreds of thousands in dark money which flooded into the area to defeat the union. Instead, the UAW signed a neutrality deal with Volkswagen preventing the union from speaking negatively of the company or engaging in house calls to asses union support. In the ensuing days, many in the Northern Media wrote off the loss at Volkswagen as a sign that Southerners would never vote union. However, I stayed in Chattanooga after other Northern reporters left because it was so important to me to show that the election could have been winnable if the UAW had prepared differently for it. I got asked to write for the New York Times on how the backroom deal supported by the UAW without the consent of their membership ultimately hurt them in a piece entitled “Sweetheart Deals Hurt Organized Labor”. Then I dug deeper and proved that many Volkswagen managers actively resisted the union drive and retaliated against union activists despite the neutrality deal that Volkswagen had signed with the UAW. My piece showing why Volkswagen managers did this, entitled “The Battle for Chattanooga: Southern Masculinity and the Anti-Union Campaign at Volkswagen”, was named by Cornell University Labor Professor Kate Bronfenbrenner as one of the five best labor magazine stories of all times. My stories initially angered many in the UAW, who refused to grant me access for some time, but over time those same stories provoked a debate within the union. Eventually, the UAW cast aside its “partnership” with Volkswagen. Now as they approach a second union election, they are taking a more militant tone towards the company. In the years I spent in Chattanooga covering the attempts to keep going after the defeat, I learned the most important lessons of my career from gritty Southern organizers who weren’t willing to say “give up” when it came to progress in the Deep South. They helped inspire me to launch Payday Report in Chattanooga as a way of beating the blacklist after getting fired for union organizing at Politico and telling labor stories that the mainstream media was ignoring like the wave of union organizing that was about to sweep the South in the #RedforEd movement. I learned from black Vietnam Veterans tales of the Civil War which made me proud to be American. I learned tales of Southern guerilla resistance against the confederacy. I learned the tales of Southern folks who don’t know how to give up. Southern folks whose resistance would never stop against unbeatable odds. In Kentucky, I learned from young teachers in the early stages of laying the build blocks of the #RedforEd movement and have recently inspired a recent wave of sickout strikes at schools through Tennessee. In March of 2017, when Bernie Sanders and Danny Glover lead 5,000 Nissan workers and their supporters, you could tell that even though Nissan workers were losing, they were setting an example of how to keep hope alive. In a few weeks when the federal government sets the date for a union election at Volkswagen, something else will shift and we will want to be there to share what will be a complex story about what it means to be Southern. Now, as many observers are optimistic about the UAW’s second attempt, I want to go back and help uplift Southern voices which have stories that too many of us in the Rust Belt and the North have ignored for too long. However, doing so is expensive. Once again, I will need your support as readers in order to rent an airbnb, rent a car, fly down there, and afford food. The entire trip will easily cost me more than $2,000 if I wanna spend a week or two on the ground to really get the story. This figure does not including making enough money to pay my other bills as a reporter. So, please donate if you can. We are hoping to raise $2,000 so that we can go down and camp out for a week or two. Hopefully, we can pool resources to rent a place where we could help orient other reporters showing up to Chattanooga. Be the first to comment on "Help Me Get Back to Chattanooga to Cover UAW Re-Vote at VW Five Years Later"